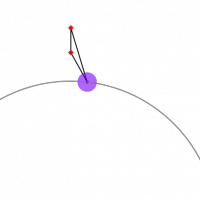 The machine reaches equilibrium when the bars are as far apart as possible, hence finding the solution to Regiomontanus’ Problem. You can drag the ends of the bar to change the problem. Press Show to see the circumcircle of the ends of the bar and the mass. You should notice something about the position of this circumcircle at equilibrium.